some things we didn't know about her. It immediately made me think "What do my readers not know about me?". Of course a bunch of things popped into my head. This made me want to write a post to share 10 things I don't think you know about me. 1) I grew up in San Jose, about an hour south of San Francisco, for the first 11 years of my life. Though my dad's job relocated us to the Las Vegas Valley, the Bay Area still feels the most like home to me. Honestly I can still go to San Francisco, inhale, and it smells like home. Even though I grew up inland from SF my mom and I would go to the city all the time and I feel more connected to the city. 2) I was home-schooled. That's right, I never went to public or private school. My parents asked me every year if I wanted to go and I always said no. Even when we moved they asked and I remember telling them that "I don't want to spend my time in such a responsive environment." when I was 11. However, my parents made sure I was super social and I belonged to a home-school group where my mom organized all the field trips. They didn't want me to be a stereotype. I finished school at 16 since I chose not to take a three month summer vacations but instead take off the month of December for the holidays. 3) In my late teens I worked for a local music promotion company. We worked mostly with metal and punk-pop bands. I was able to meet so many musicians and work at different events, like Warped Tour and other local music festivals. I set up meet and greets with bands and got to run around like crazy and then see bands play their sets from backstage. It was a great time with amazing memories that I would never trade for anything. I worked there until I was about 22. 4) I got kicked off of the girls tennis team for being too aggressive/competitive. That's right, they used to call me Johnny McEnroe. The coach had a talk with my mom and said the girls didn't want to play with me anymore because I was "very competitive". My mom was about to go mama bear when he told her he wanted me on the boys team instead, where I'd be more challenged. She simmered down and next thing you know, I was beating all of the guys and was the top player on the team. 6) I have 7 tattoos. I realize that because I talk about beauty you don't see them much. One of my arms has nearly a completed half sleeve, so you could say I have a significant amount of tattoos. 7) I have generalized anxiety and panic disorder, along with PTSD. I don't really talk about this too much as it doesn't pop up often in regards to beauty. All I can say is that it's something I have learned to manage, some days are hard, some I don't even notice. One thing I wish I had done sooner was go to a therapist to learn how to manage it and discuss it with people around me. Something I wish I had heard was that if you dislike your first therapist find another, and another until you click with one and feel safe. Mental health has a weird stigma, but the more we talk about it and normalize it, like any other health issue it, the more people will feel comfortable asking for help. 8) I have two dogs. Huckleberry Finn (Huck for short) and Sawyer. Huck is a 5 years old Australian Shepherd and is as funny as he is sweet. Sawyer is an 8 year old Border Collie/Golden Retriever mix and is loyal and gentle. They're both rescue dogs and I adore them. 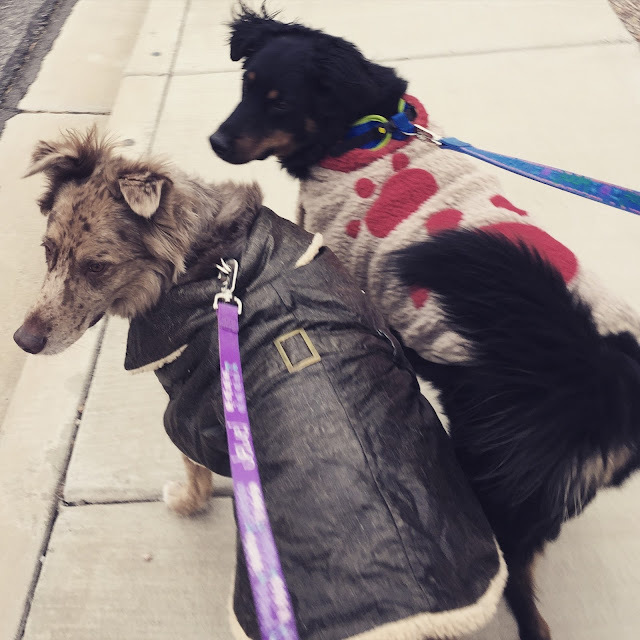 I had to include this picture of them on a walk last Christmas. It was about 35 degrees out, hence the coats. Huck is on the left and Sawyer is on the right. 9) My favorite weather consist or grey skies with a on and off rain and cold...maybe some snow. I always say it's because my favorite things start when it's cold, Halloween, Thanksgiving, Christmas, New Year's Eve, Valentine's Day, and then my birthday in February. Both my parents' birthdays are in the winter as well. 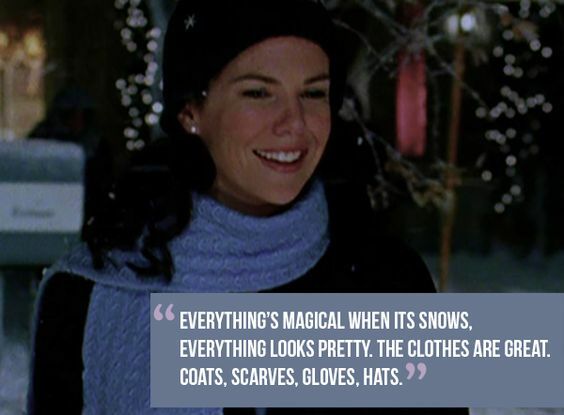 I am just a Lorelai Gilmore, I swear I can smell the cold weather coming. 10) If the above two images weren't enough of a hint Gilmore Girls is my favorite show. Don't get me wrong, I love The Walking Dead, Game of Thrones, Son's of Anarchy and all that stuff, but watching these two fast talking ladies is like going home to have a hot meal your mom made you because you had a hard day. (Hopefully that made sense!) Yes, I am beyond excited that Netflix is making dreams come true with the revival with the closure I never got from the unexpected cancellation of the show years ago. would know about me. It was so fun writing it and I have to thank Katya for inspiring this post. Please go read her post that inspired me if you haven't already.